The ACS Athens Elementary program relies heavily on the synergy that comes from good teamwork. 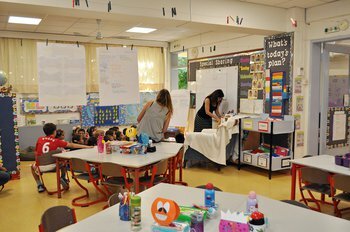 Classroom teachers work in tandem with their grade level colleagues and specials teachers. The child receives the benefit of teachers using their individual and collective strengths to help the students learn quickly and feel successful. The Elementary School is located on the west side of the ACS Athens campus. Shaded by mulberry trees, the Elementary School’s main building holds the Main Office, Counseling Office, Library, 1st - 4th grade classrooms, Art Room, Science Lab, Cafeteria, P.E. Room, Multi-purpose Room and classrooms for Foreign Language, and ESL. The Technology Lab and OL classrooms are located in the High School Annex building. The Junior Kindergarten and Kindergarten enjoy their own wing “Early Childhood Area” and a large grassy playground. The 5th grade classrooms also have their own wing close to the Middle School building. The Music classroom is located on the side of the Elementary School right across from the Early Childhood area. The Health Office is located in close proximity to our classrooms. There is a commitment to ongoing upgrading of facilities to provide for a better learning environment. The Elementary School sits across the courtyard from the Middle School and Academy’s special facilities, which are sometimes shared. They include the Hasib J. Sabbagh Library, Gymnasium, Swimming Pool, Soccer Field, Tennis Courts, and Theater. Every student at ACS Athens studies Mathematics, Language Arts (Reading and Writing) daily. Units of study alternate between Science and Social Studies. 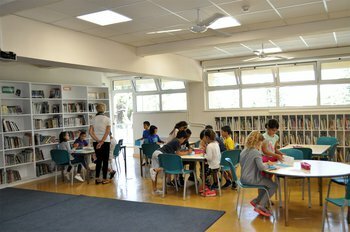 In addition, each grade level meets with specialist teachers throughout the week for Art, Music, P.E., Technology, Science, Library, Arabic, Greek or English as a Second Language. Students are supervised on the playground from 8:15 a.m. to 9:00 a.m. The school day begins at 9:00 a.m. and ends at 3:45 p.m. All students are asked to arrive at least 10 minutes early to school so that they can be ready to learn at 9:00 a.m. sharp! Units of study in Science and Social Studies provide a context for students to apply their basic skills in Math and Language Arts. In addition to mastering the basic tools for learning, students learn to think conceptually, gather facts and acquire knowledge, apply and practice skills, develop attitudes and take action. The Elementary School views students as thinkers with important, emerging theories of the world. 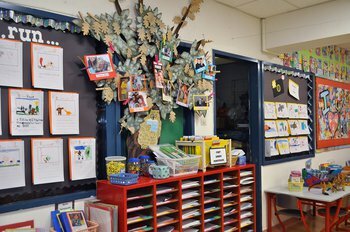 Building on students’ prior knowledge, teachers integrate their curriculum using a range of teaching strategies, and resources. Rather than focusing on isolated and non-contextualized facts, students develop critical thinking skills to become lifelong learners, problem solvers and positive contributors to our global society. Students are also involved in the learning process by giving critical feedback to their peers and themselves. Assessment can occur from written tests, lab reports, presentations, performances, observations, research papers, projects, etc. Report cards are used to assess students' level of mastery and to provide important anecdotal observations about a student’s progress and social development. Students take a standardized, norm-referenced test (MAP) twice every year in grades 3 - 5. Once a year students lead their own conferences and communicate their learning to their parents using a portfolio of their work during the Student-Led Conferences. Textbooks supplement, rather than direct, the curriculum at ACS Athens. Students learn beyond typical textbook requirements and strengthen higher level thinking skills. In addition to the texts listed, teachers frequently draw upon primary sources (including guest speakers or performers), library/media, online resources, computer software, trade books and literature to supplement the curriculum. Textbooks are provided to all students through their classroom teachers. All books loaned to students will be returned to the teacher at the conclusion of each course. Students who withdraw from school should return all textbooks before their records can be cleared. If a student fails to return books or damages them, there will be a fee to replace the textbook.